Second, they have great spaces for parties! I love the open kitchen in the area that used to be a restaurant. The name escapes me now, but it has an adjoining function room which is great for an event that fits 100 people. Third, back to Jasmine. It's a whole New World, a new fantastic point of view. *Get it? Heehee. * It looks a whole lot different from the last time I was there, when it was still Emperor Court. There's a chic, modern chinoiserie vibe to the place, and overall, I find it a great place for a lunch meeting, family gathering or a pig-out date with the hubby or with the girlfriends. I won't describe each dumpling, puff and bun we had in detail, but just trust me when I say everything is delicious! Enough to warrant repeat visits and tell everyone I know, it's a must go! 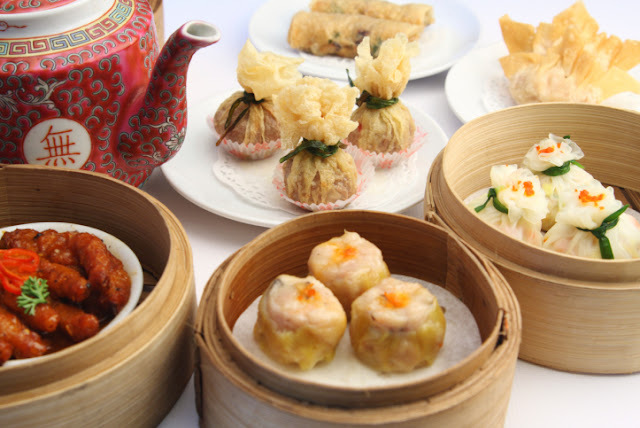 Your Php660 net for unlimited dimsum includes a choice of tea or soda. On weekends, you may opt for your dimsum to go with sparkling wine instead at Php950 per person. We also got to try dishes that are not part of the unlimited dimsum menu, but are chef specialties that are also worth a try! We capped our excellent meal with mango cream, pearl tapioca and walnut cookies. This dessert alone is worth going back for. Jasmine is open daily from 11:30 am to 2:30 pm for lunch/unlimited dimsum and from 6 pm to 10:30 pm for dinner. For more information and reservations, call 811-6888 ext 3338. Esperanza St. cor Makati Ave.